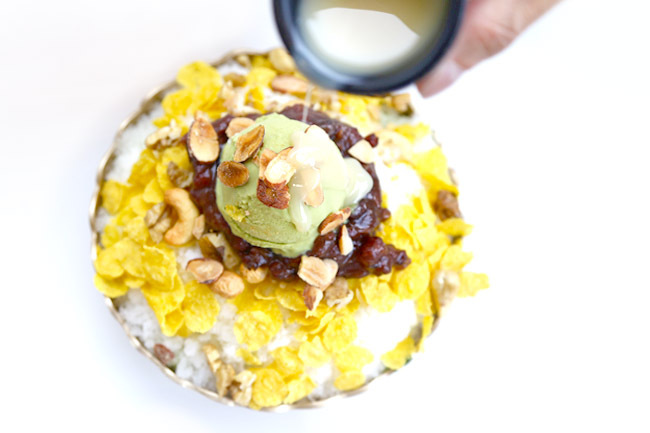 How many Korean Bingsu shops do we need in Singapore? Many, many, apparently. On last count, there are 7 new Korean cafes offering this dessert that have opened/will be opening this month alone. 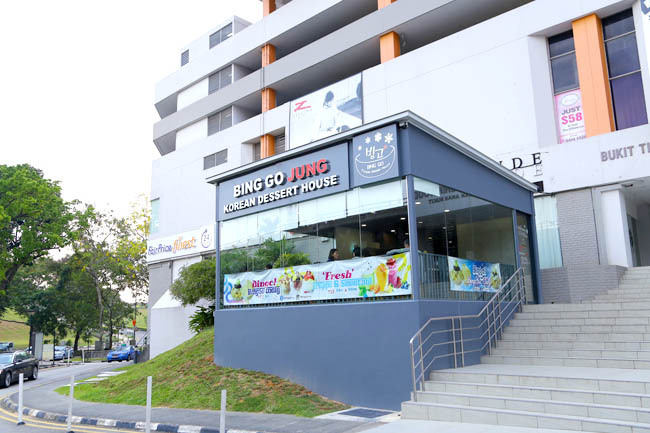 Bing Go Jung Korean Dessert House is one of the first to set up a bingsu specialty house in Singapore , located at Guillemard Road beside Ju Shin Jung Korean BBQ. (I was lost until I spotted a big big GSpa at the former badminton hall). First shop advantage. 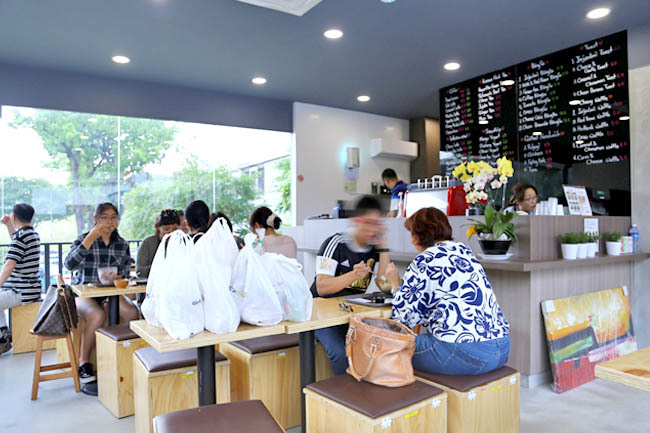 Their new branch is at Bt Timah Plaza, a strategic venue to target the active Korean and expat community in the area. 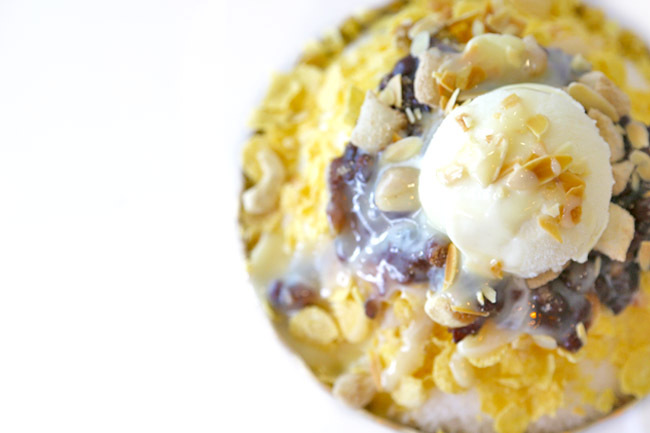 Many Singaporeans term the ‘bingsu’ as the more expensive version of ice kachang. The origins go like this: Bing Go Jung’s Mdm Yun said that bingsu was discovered in the Joseon Dynasty, when the soldiers crushed ice kept in ice houses called ‘binggo’ to eat with fruits. Thus, the name of the shop. The varieties sold here include the popular Milk & Red Bean ($11), Injeolmi ($11), Green Tea ($11) Coffee ($11) and an intriguing Tomato ($11), along with toast, grilled sandwiches and chewy waffles. I noticed that prices were 50 cents higher here, unless they have also raised prices over at Guillemard. 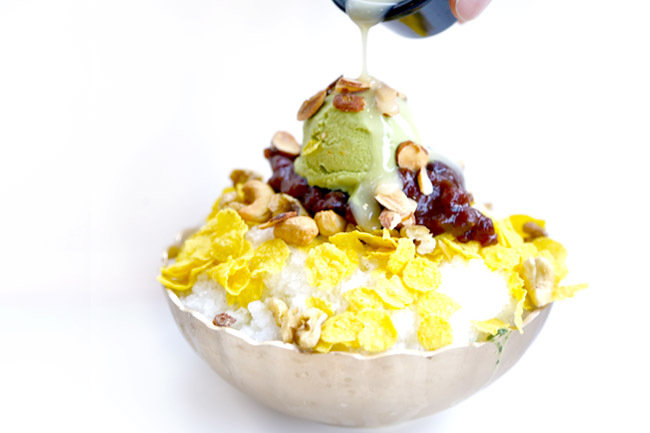 The Green Tea Bingsu ($11) came in an off-gold bowl topped with crunchy corn flakes, slices of almonds, walnuts, cashew nuts and a scoop of green tea ice cream and sweetened red beans. The combination tasted sweet on its own, so go easy on the condensed milk. After trying that many Korean Bingsu shops in Singapore, the bingsu may pale in comparison if we looked at texture alone. The shaved ice was still smooth, but not as fine as what you would get at Nunsongyee or Snowman Desserts at NEX. Also because the latter used milk shavings. Bing Go Jung’s version would fare somewhere above the average. We liked it for the portion and ingredients which gave a variety of textures. Friendly Korean service too. I always wonder why bingsu and KFC are so popular to come out of Korea and into Singapore. Why does a popular tteokbokki brand like Jaws come over to Singapore and offer something different. Maybe the demand is just not there and nobody wants to take a risk. I guess too much bingsu can never be a bad thing though, right?